One meteorologist estimated 20 trillion gallons of water could fall on Texas in the next week. Texas Gov. Greg Abbott said “dramatic flooding” became his primary concern after Harvey was downgraded to a tropical storm Saturday. Mandatory evacuations were ordered for parts of the Houston metropolitan area near the Brazos River, which could experience a record crest. Two storm-related deaths have been confirmed since Harvey made landfall on Friday. VICTORIA, Texas ― After Hurricane Harvey was downgraded to a tropical storm on Saturday, meteorologists issued warnings about the potential for “catastrophic and life-threatening flooding,” as many areas between San Antonio and Houston are expected to get massive amounts of rainfall. Meteorologist Ryan Maue said 20 trillion gallons of water could fall on Texas in the next week. Michael Lowry of the University Corporation for Atmospheric Research said that more than 60,000 square miles are under high or moderate risk for excessive rainfall through Sunday morning. At least two storm-related deaths have been confirmed, and imminent floods mean many more Texans could face danger in the next week. During a press conference Saturday, Texas Gov. Greg Abbott (R) said “dramatic flooding” was his primary worry about the tropical storm, which barely moved throughout Saturday evening. On Saturday, flooding caused the death of one motorist in Houston, according to Gary Norman, spokesman for the city’s emergency operations center. He told the AP late Saturday that the person, identified as a woman, had been driving along flooded streets when she “got out of her vehicle in high water.” The cause of death has yet to be confirmed. Earlier Saturday, C. J. Wax, the mayor of Rockport in Aransas County, confirmed the death of a man who died while trapped in his burning house, unable to be reached by rescuers during the height of the hurricane. Wax said at least 12 other people sustained injuries. Rockport, where the storm made landfall Friday night, appears to be the hardest-hit area so far. The town of 10,000 is about 30 miles north of Corpus Christi, and has reported major damage to homes and businesses. Officials there told The Weather Channel that the loss of cellular coverage was hindering rescue work. A man walks through floods waters after surveying his property, which was hit by Hurricane Harvey in Rockport, Texas. The rain came down hard Saturday afternoon, and while the wind remained strong, it was nothing like Friday night’s, which brought down trees and electric poles. Along a stretch of road just south of Victoria, 30 miles from the coast, most of the buildings were boarded up and evacuated. The wind and rain made travel conditions through Victoria hazardous Saturday. The city had widespread power outages, with most of the stop lights in the area not working throughout the day. The Texas National Guard was assessing the damage in the area Saturday afternoon. Debris and power lines covered many of the streets. Several huge trees, pulled up by their roots, had fallen on top of houses and across roads, making some of them impassable. The majority of broken windows were in large buildings. Storm-wise residents had boarded up their windows and taped their plate glass. As of Saturday afternoon, there appeared to be no major flooding in Victoria, though some low-lying streets were under water. Natural gas could be smelled in some areas, suggesting some lines had been broken. No gas stations, stores or restaurants in Victoria appeared to be open. Despite the damage, lots of people were driving around the area Saturday afternoon. About an hour and a half away in Rosenberg, a city in the Houston metropolitan area, mandatory evacuations were ordered after forecasts predicted a record crest of the Brazos River, which could lead to major flooding. The massive, slow-moving storm dumped almost 15 inches of rain in some parts of Texas, and is expected to stay over the state for up to eight days. Abbott said Saturday a disaster declaration has been issued for 50 of Texas’ 254 counties. The National Weather Service issued flash flood warnings for Houston Saturday. 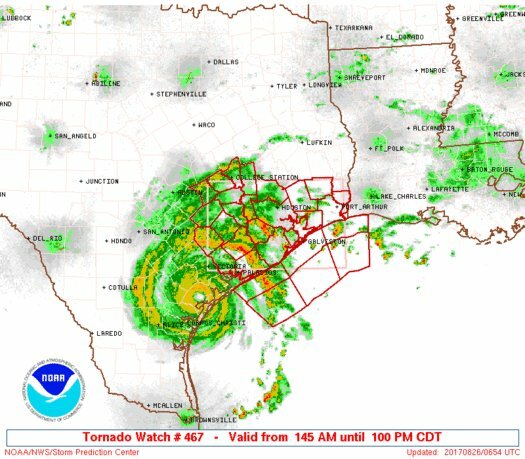 There was a tornado watch in effect in parts of the state ― and reports of a potential tornado strike in Katy, just outside of Houston. The National Weather Service began issuing flash flood warnings for Houston Saturday morning. The National Hurricane Center warned that the coast should expect 15 to 30 inches of rain, but possibly as much as 40 inches in some areas. Houston, the country’s fourth most populous city, is included in the high-end of those rainfall projections. “This prolonged pattern continues to favor rounds after rounds after rounds of very heavy rainfall that will lead to catastrophic and life-threatening flooding,” warned the National Weather Service’s Houston/Galveston division in a message Saturday morning. The threat from storm surge waters is also ongoing, with surges of 6 to 12 feet above ground level projected along the coast between Port Aransas and Port O’Connor. The Electric Reliability Council of Texas said more than 300,000 people were without power at one point Saturday. On the Bolivar Peninsula in Galveston County, the Crystal Beach Volunteer Fire Department said the powerful winds fanned flames engulfing a beach house. WATCH: Winds of Hurricane Harvey spread flames on a beach house on Bolivar Peninsula, Texas. President Donald Trump, who faced criticism from some for using the storm to his political advantage, tweeted that he was continuing to monitor it Saturday. See more storm updates from overnight Friday. This article has been updated with new details, including updates on fatalities, damage, the downgrading of the storm and the latest weather forecasts.